Colors shining through our morning windows are now brilliant as we expect from a New England Autumn. Time to feed the birds, as the deck is cleared of the plants they love. 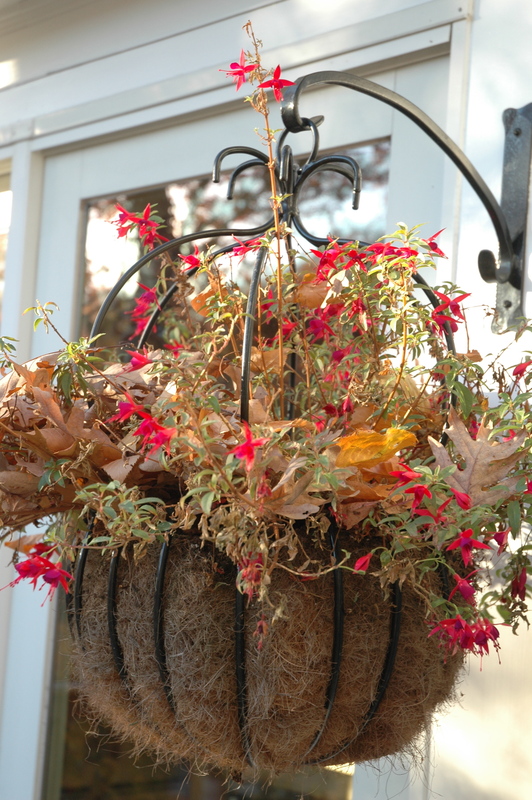 Leave one plant, a fuscia as long as it lasts, for a stray hummingbird. Could a hummer still linger in this frosty season? They aren’t so hardy as those birds we help along all through the colder season. When the Dutchman’s Pipe begins to fade, we know it is time for wood fires and maybe a long afternoon of reading poetry or the best novel just published. To-morrow they may form and go. This entry was posted in Uncategorized and tagged New England Autumn, Robert Frost. Bookmark the permalink. Love the bird house feeder! What a cute idea! Your photos show the autumn light so beautifully. I love that Frost poem about October. Lovely photos. Do you find that post to be adequate to growing Dutchman’s Pipe? I’ve heard it will take up a lot of space. Thanks for the Robert Frost snippet – it’s new to me, but captures the beauty and poignance of fall beautifully. 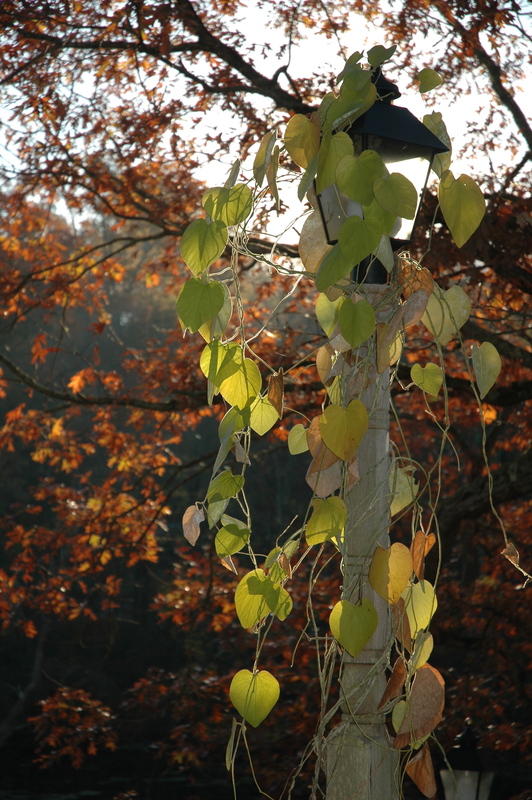 Your photo of the fading Dutchman’s Pipe is especially nice as an accompaniment to the poetry and the season. 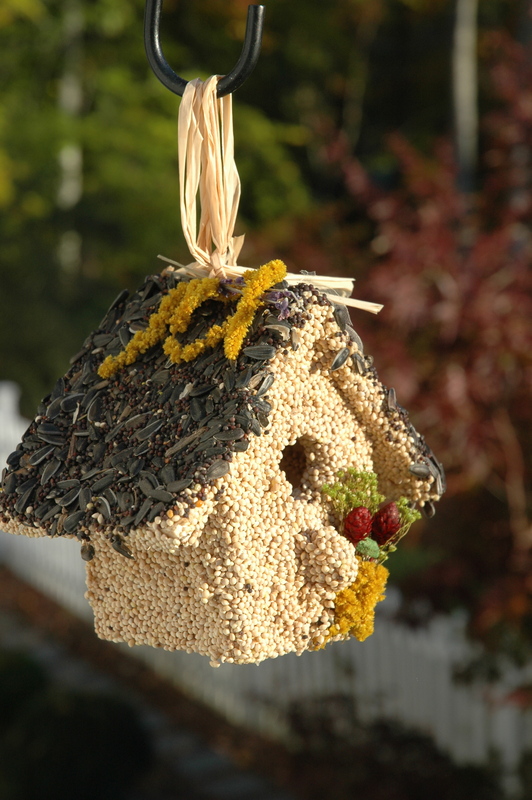 Your bird house is going to keep all your birds very happy for some time to come, a lovely idea. I love the autumn colours and the way that they fade, such a beautiful time of year.